I love chocolate as much as the next girl, but lemon cookies rank high (if not highest) on my cookie favorite list. And this is a very nice one. These cookies are little soft puffs of sweet & tangy lemony goodness. Oh - and did you notice? 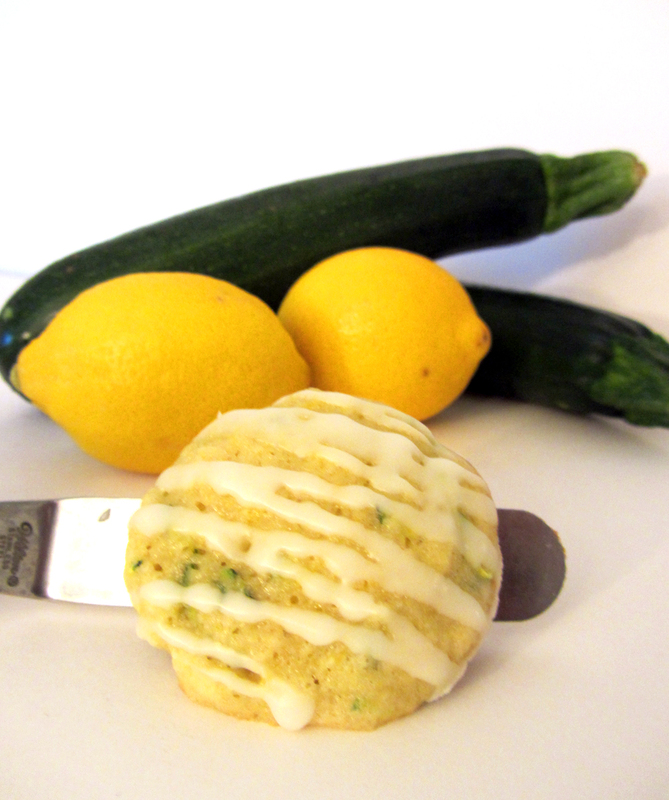 They are made with zucchini! The zucchini doesn't add flavor, but helps make these little lovelies moist and perfect. And...dare I say healthy? This recipe is adapted from one at City Home Country Home. The cookies are very much like tender cake. Once cool, they're finished with a tart drizzle of glaze. Very yummy! So, get more veggies in your diet...have a cookie! 2. In a medium bowl, whisk together the flour, baking soda, and salt. Whisk in the lemon zest. These are the dry ingredients. Set aside. 3. In a small bowl or measuring cup, stir together the yogurt, milk, and extracts. These are the wet ingredients. Set aside. 4. Combine the butter and sugar in the bowl of a stand mixer. Beat until light and fluffy. Beat in the eggs, one at a time. Scrape down the sides and bottom of the bowl. Beat again until thoroughly mixed. 5. With the mixer on low speed, mix in the zucchini. 6. With the mixer still on low speed, mix the wet and dry ingredients one after another in the following order: 1/3 of the dry, 1/2 of the wet, 1/3 of the dry, rest of the wet, rest of the dry. Mix until just blended. 7. Scrape down the sides and bottom of the bowl and give the mixture a final stir by hand. 8. Scoop the dough by the rounded tablespoonful onto the prepared baking sheets, leaving about 2" between each. 9. Bake for 9-11 minutes or until the edges are golden and the centers are set (like cake). 10. Transfer the sheets to racks. Cool the cookies on the sheets for one minute. Transfer the cookies, still on the parchment paper, to racks to cool completely. 11. For the Icing: in a medium bowl, combine the powdered sugar and lemon juice. Beat with an electric mixer until smooth. 12. You can use a spoon, piping bag, or plastic bag with the very corner cut off to drizzle the icing over the cookies. Let the icing set.